#MIZ12 is shipping out in just a few days and I'm sharing SPOILERS! As you might already know, the theme of the box is GYMSETTER. I blogged about why I chose this theme and announced the Golden Ticket prize that comes with it RIGHT HERE! I honestly can't wait to see who wins. I hope it's YOU! Because then I get to meet you! We also decided to add some smaller Golden Ticket prizes to the pot. Heard of Fleeps? They're funky flip flps with an ankle-wrap closure that you can customize with color. Have you ever lost a flip flop while wearing it--as in, it flew backwards off your foot? It happens to me all the time when I'm walking fast or rushing somewhere. This won't happen in Fleeps because of the ankle-wrap but the true draw is how cute they are! Before I get into #MIZ12 Quarterly Box spoilers, I want to share this unboxing for #MIZ11. I like to give people who aren't subscribed yet a look at what goes into my Quarterly Boxes and how I put them together. There's meaning behind why I chose each item and why I think it will benefit your health & wellness journey. I challenge you to try my resistance band workout! I fell in love with the #MIZ11 box because everything I planned to put inside worked out so smoothly. Every brand was so excited to be a part of the mailing and it was designed without a hitch. This isn't always the case during the design/curation process. There are often products I'm dying to put inside that don't make it in...and it can be a real bummer. I talk more about that here --> what it's like to curate a subscription box (about half way down the article is where I get into it). 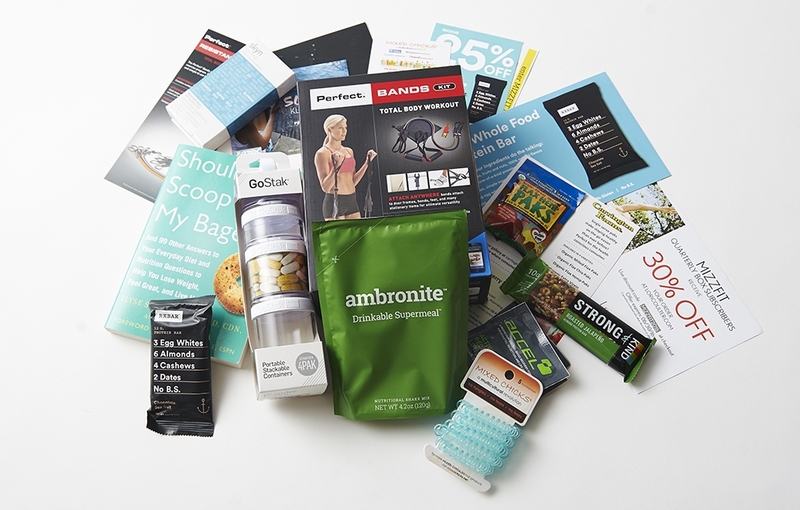 It's hard topping a great box like #MIZ11 but I'm attempting to do that with #MIZ12 by curating a travel kit that fascilitates fitness on many levels. I also made it a priority to cater to subscriber requests. SPOILER #1: Some of my long time subscribers kept asking for a dance oriented workout so I made sure to secure 1-month of online classes from DanceBody. Katia Pryce who created the workout used to be one of Tracy Anderson's lead instructors until she decided to create her own brand. It's a cardio dance workout that burns lots of calories and helps tone parts of your body that many strength training workouts don't pinpoint. SPOILER #2 and 3: Energy is crucial to maintain a consistent workout routine. I start with a coffee every morning and rely on technology to keep me plugged into my fitness apps and make sure my bluetooth earphones are charged for my runs. So I made sure to package "energy" inside of #MIZ12 in the form of Coffee Blocks and a myCharge "power shot" charger. Coffee Blocks is an innovative butter coffee that optimizes brain function and helps you perform at your best. myCharge makes the best chargers in town. The one that you're getting is packaged like a 5-hour energy shot. It's compact, lightweight and perfect for charging all your tech accessories. SPOILER #4: This last spoiler brings me so much relief because I've been trying to put a EFFECTIVE natural deodorant into my Quarterly Box for nearly 2 years! And I finally found one that we literally had custom made for #MIZ12. It comes from a woman-owned company called Buddha Body & Bath, which makes NATURAL high quality body care products. You're going to love it! I made sure to test it over the course of 3-months to make sure it didn't irritate my skin as many natural deodorants have this problem due to the ingredients used (baking soda can be an irritant). The rest you'll have to discover for yourself when the box shows up on your doorstep! If you're new to my Q-boxes, I hope I've convinced you to subscribe. ORDER #MIZ12 HERE! I put 500% love, research and testing into each mailing. Plus, I read all your emails. So make sure to keep providing feedback and sending me your requests. Can't wait for you to receive #MIZ12!